Like many others, I’ve been eagerly awaiting the launch of Blizzard’s Hearthstone (Free) for iPhone (which was originally announced late last year). With today’s news that a universal update is now live on the App Store, I quickly downloaded it on my iPhone 6 to check out what the key differences are. 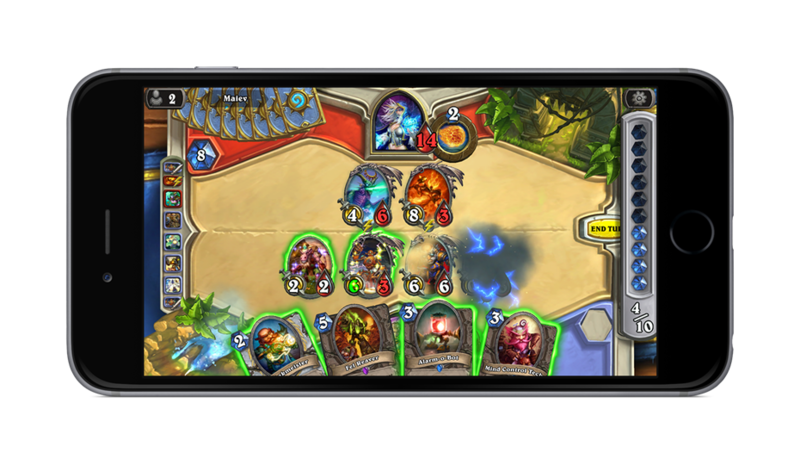 As you might expect, the iPhone version of Hearthstone is basically the Hearthstone we all know and love on iPad except… smaller. The primary changes have to do with how you interact with your cards during matches. For example, on the iPad version all your cards are simply at the bottom of the screen and you’re free to thumb through them at your convenience while the match is being played out. On the iPhone version, your cards are shown on the bottom right of the screen and tapping them expands the view and allows you to actually interact, see descriptions, and play said cards. 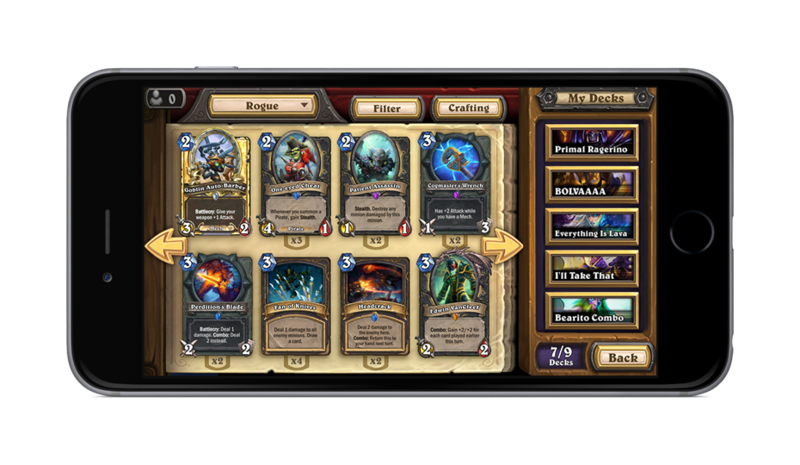 Expanding the card view blocks most of the field of play, which is the primary concession made for Hearthstone making the transition to iPhone. It’s important to note that you can’t interact with your cards when they’re minimized; doing so will most likely launch your iPhone’s Control Center more than anything else. However, thanks to the iPhone’s retina display it’s pretty easy to see at a glance what cards you have. Another visual change is how you view the effects of cards already in play. A tap and hold brings up the whole card but again pretty much blocks the whole rest of the screen. Other than the card view, Hearthstone is (as it should be) pretty much the same as you’ll find on all the other versions. All practice modes, Ranked and Casual online matches, spectator mode, and Solo Adventures are available on the smaller screen. The same goes for buying and open packs and chatting with your battle.net friends. For most this should seem obvious but folks afraid that the iPhone version would lose features in its transition to the smaller screen need not be worried. If anything, I’d argue that being able to easily play from your iPhone on cellular data is a huge improvement. Personally, I think the iPhone version works really well. I’ve been pining for a way to truly play Hearthstone on the go and Blizzard’s implementation is top notch. Folks looking to transition to iPhone play will just need to learn one or two nuances in terms playing cards, but otherwise should have little problem enjoying it. If you’re just starting out in Blizzard’s popular CCG, we have a variety of guides and tutorials available for you to peruse.